The statement of Prime Minister for developing Gwadar as Singapore, Dubai and Hong Kong trade hubs in presence of Army Chief and Chief Minister Baluchistan is a good news which has hurt the supporters the of freedom fighters hiding in Europe more than their hired terrorists. International analysts are of the view that in the upcoming days Baluchistan will face a tremendous wave of terrorism and propaganda against national security agencies. Propaganda that is already targeting Pakistan army and blaming Pakistan army for instability in Baluchistan; these propagandists have been encouraged by the crises among political leadership and army. Even now pro-Indian intellectuals (whose enmity against Two Nations Theory is no more a secret) and NGOs have increased propaganda against Pak-Army in their workshops. Especially regarding Baluchistan people are being brain washed that army is forcing Baluchistan to be part of Pakistan through force while army and its sub-departments are responsible for under development of Baluchistan. If we look at the situation of Baluchistan since partition in 1947 few infamous Baloch feudal lords having links with India started opposition of Two Nations Theory and cession of Baluchistan to Pakistan (not only in Baluchistan but in KPK as well), perhaps they were afraid of losing their feudal control over the area. But the history tells us that behind “Greater Baluchistan” or “Greater Pakhtunistan” there always had been only one foreign power. Irony of the fate is whoever came in power either Democratic Political leader or Martial Administrator they ignored Baloch people and prolonged their reign by extending undue cooperation to Baloch Feudal Lords; in this way all the grants and packages for development of Baluchistan were shifted to the coffers of these Baloch Feudal Lords. Resultantly, those feudal lords who were not taken on board by govt. raised slogan of freedom of Baluchistan. Leaving aside how much has been paid to these feudal lords in last half century for development of Baluchistan; just look at the grants since 2008 for education only are more than 800 billion rupees. Grants for construction of roads, health and other development projects are separate. All these grants were eaten up by those Baloch Sardars’ who are now meeting expenses of their extravagance at Europe through these grants for poor Baloch and also raising hue & cry for the freedom and rights of Baloch people. Same like arguments are forwarded in the opposition of Gwadar port that companies and big businesses will have to hire well educated and qualified persons from other areas which will change the status of locals to minority. Such like arguments are used by anti-Pakistan elements to brain wash Baloch youth against Pakistan but no one would ever tell poor Baloch people that the main cause behind their being uneducated and unskilled is the policy adopted by their Feudal Lords so that Baloch could be forced to accept feudal system as their fate which Baloch youth has to bear with now. Those Baloch feudal lords who protest for rights and freedom of Baluchistan forget that in their feudal states they are not ready even to give the right of freedom of thought to their poor Baloch subjects leaving aside the democracy or freedom of choice. Women are buried alive if they differ with the thoughts of males in the name of culture and traditions and Feudal Lord is the one who decides the fate, life and death of his subjects. Why propaganda against army and only army? Why propaganda against intelligence agencies in the name of missing persons. There are only two reasons behind all this propaganda war! 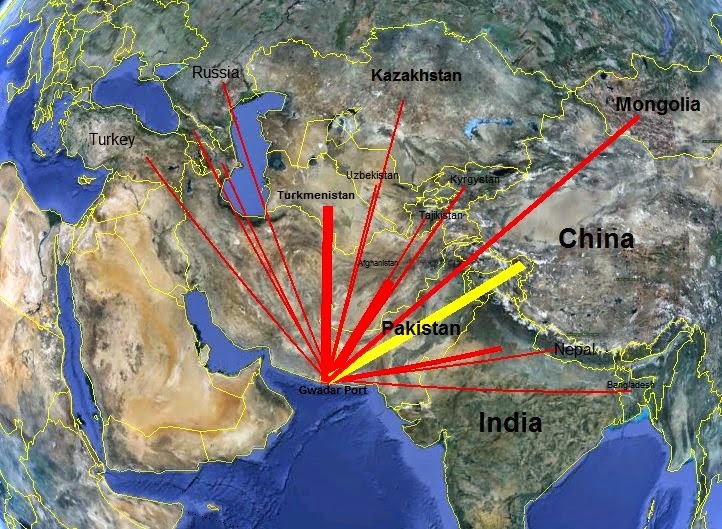 No 1) Countries around Pakistan want to stop the Chinese access to Gwadar at all costs. Plan in this regard started in 2002 with the finalization of Pak-China deal for development of Gwadar port. Kidnapping, target killing, and terrorist attacks all such ways were utilized but China completed Gwadar port even before the fixed time. This fact is still preserved in the newspapers of that time that when Chinese President to inaugurate Gwadar, Chinese intelligence agencies advised President not to visit Gwadar port as terrorists have planned to target him at any cost. 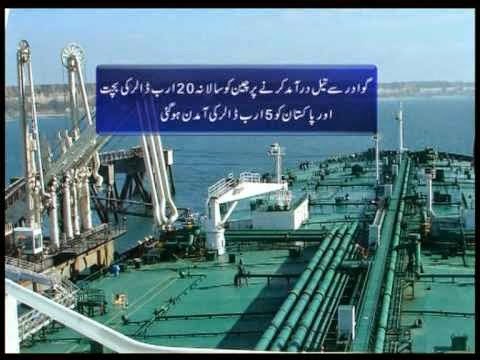 Gwadar port got completed somehow but now the only way was to stop Gwadar port from getting operational for which enemy converted Baluchistan into hell of terrorism. Target killing of Shiites, targeting buses of pilgrims, suicide terrorists attacks over Hazara community, attacks over military and govt. installations, attacks over trains, targeting of gas and power transmission lines, in other words no stone was left unturned by enemy to destabilize Baluchistan. In other to tackle all these conspiracies of enemy Pakistan has only one force, “Pakistan Army” that can counter terrorists disguised as freedom fighters and “Safari Camps” of terrorists being run with the foreign support. Irony of the fate is that these foreign funded terrorists (disguised separatists) target innocent people, defense and govt. installations; our free media, AMAN KI ASHA brand intellectuals and enemies of Two Nations Theory not only remain silent but telecast interviews of these terrorists but when Pakistan Army acts against these terrorists our media and pro-Indian journalists start crying and propaganda against Pak-Army. Enemies of Pakistan in Europe and West on the basis of this propaganda try to take this matter into UNO alleging Pakistan army for genocide, present bills in US Congress for freedom of Baluchistan. Because these are the Pakistan army and its intelligence agencies that are the greatest hurdle in the way of damn plans of the enemies. Poor Baloch are also well aware of the importance of the Pakistan army as they know that whether flood, famine or any other calamity this is the Pakistan army that is first to reach the calamity stricken area. But propagandists in order to secure their payments from abroad only give importance to the terrorists not the poor Baloch. Of course wherever there will be lawlessness Pakistan army would be sent to tackle with these insurgents and of course army will not present them with flowers or gifts but reply with bullets in return of their terrorism against public. Whether it was Sawat or Malakand inevitably Pakistan army had to conduct the operation to clear the area from Indian trained foreign funded terrorists and Pakistan army is still present there because civil govt. and machinery is not ready to accept the responsibility of maintaining law and order in the area. Such like is situation is being faced in Qalat where foreign funded Baloch terrorists are targeting innocent youth and torturing them to join terrorists; anyone who dares to say NO is kidnapped, tortured to death, dead bodies are thrown into deserted areas, blaming army for all this with the help of propaganda over the traitorous media. 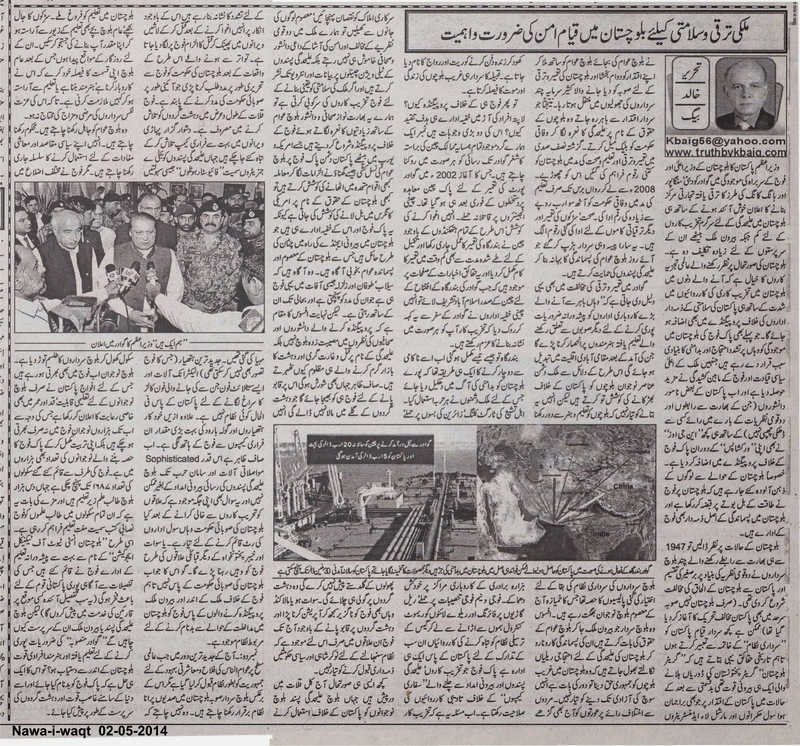 When situation deteriorated, Provincial govt. 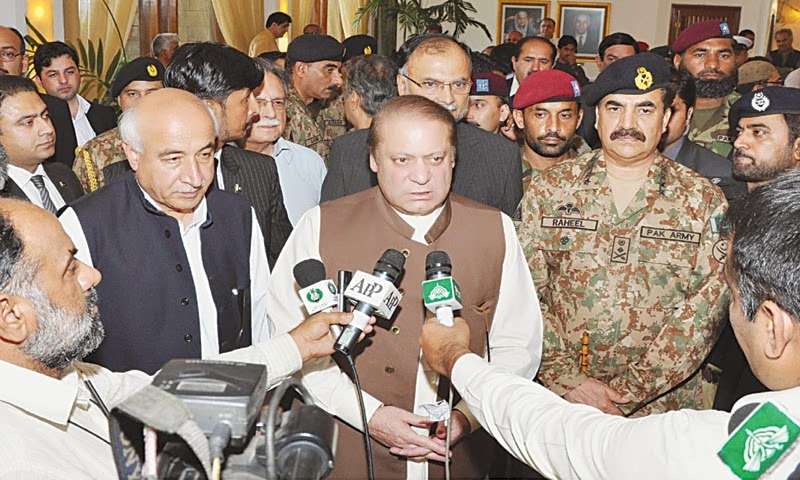 of Baluchistan was forced to write to Pakistan army to support govt. against these terrorists and constitution makes it the duty of army to provide support to civil govt. So Pak-Army is busy in hunting the terrorists in Qalat, many terrorist training camps in Qalat have been neutralized, these training camps were equipped with latest facilities like five star hotels, stand by generators, modern weapons, Satellite Telephone sets (for which Pakistan does not have any capability of interception) moreover a big number of latest Automatic Western weapons have also been recovered by Pakistan army. How Baloch terrorists have acquired all these weapons and facilities? Of course this is not possible without the foreign support. This question is still lingering over the horizon that after cleansing the area from terrorists is civil govt. ready to establish the writ of the govt. through civil machinery? Or Pakistan army will have to maintain its presence in the army just like Tribal areas, Sawat etc, Baluchistan govt. has no answer however, propagandists of the enemy have a sophisticated plan to defame Pakistan army. No 2) In the today’s developed era when democracy has been accepted worldwide but Baloch Feudal Lords want to maintain centuries old Feudal system in Baluchistan; it is not acceptable for them that poor Baloch get educated, network of roads is established, poor Baloch children get skill and dare to chose their own fate. If poor Baloch people get education, skills etc. then they will decide their fate themselves that what they have to become in future, chose service, job or business so that his self respect is not controlled by the feudal lord or Baloch Sardar.